An Amish Christmas Love contains four novellas centered around Christmas by Beth Wiseman, Amy Clipston, Ruth Reid and Kelly Irvin. Winter Kisses by Beth Wiseman is set in December in a snowy Lancaster County. Naomi Stoltz lives with her mother, Barbara and grandmother, Ruth in the main house on their farm. They have just rented out the daadi haus to Amish construction workers who will be in the area for a month. When Ruth notices that the three gentlemen are in similar age to the three women, she is hoping cupid’s arrow will strike. Barbara has been a widow for three years and it is time for her to move on (at least in Ruth’s opinion). Ruth has been looking for the right man since she lost her husband and it is past time for Naomi to marry (according to Ruth). Will these three women get their happily ever after this Christmas? The Christmas Cat by Amy Clipston takes us to Bird-in-Hand, Pennsylvania. Emma Bontrager is a sad this Christmas as it is the first one she has experienced alone in forty-five years. Her husband, Henry passed away during the summer. Emma was invited to the Blank house for dinner, but, with the heavy snow, she feels it would not be safe to venture out. Emma is heading inside when she notices an orange tabby cat on her porch. She tries to shoo the fellow away, but instead he ends up inside and resting comfortably in Henry’s chair. Katie Ann Blank is worried when Emma does not arrive for dinner and did not leave a message. Ephraim, Katie Ann’s brother, and Katie Ann (along with two friends) decide to visit Emma and bring her some Christmas cheer. Kelly Irvin’s Snow Angels returns readers to her Bee County Amish series. David Byler has been courting Molly Shrock for the last year. Molly is hoping that David will soon become baptized and then propose to her. David and Molly are at a local auction when David sees his old Englisch girlfriend, Bobbie McGregor. Bobbie’s father has become ill and she is needed to help run their ranch. David has been in love with Bobbie, but he could not leave his community and his faith. Seeing her now brings back his feeling for Bobbie. She has not stopped loving him. David needs to make a choice about his future. Will David jump the fence or become baptized and propose to Molly this Christmas? Home for Christmas by Ruth Reid takes us to Posen, Michigan. Ellie Whetstone is a dog handler who travels the country visiting dog shows in her RV. She is visiting Posen to visit the house she inherited from her aunt, Bonnie Whetstone and get it ready to sell. Ellie follow the directions from the GPS and finds a small farmhouse. She soon discovers that she is at the wrong property when Ezra Mast returns home with his daughter, Allison. Allison instantly falls in love with Lulu, a three-year-old Standard Poodle, much to her father’s consternation. A series of unfortunate events keep putting Ellie and Ezra in each other’s path. When an accident takes Ellie away, Ezra fears he has seen the last of her. Is there a chance for love between the Englischer and the Amish gentleman? An Amish Christmas Love contains four lovely, heartwarming stories. They are about love, faith, hope, trust, power of prayer, friendship, trusting in God’s path for our lives, and the magic of Christmas. My favorite story is The Christmas Cat by Amy Clipston. It is such a sweet story and I enjoyed the antics of the orange tabby that Emma names Hank. I like how the author reveals Emma’s history with her husband and how much they loved each other. Winter Kisses is humorous thanks to Ruth (she is a lively character). Snow Angels had a slower pace than the others and it ties into Kelly Irvin’s existing Bee County Amish series (can be standalone). 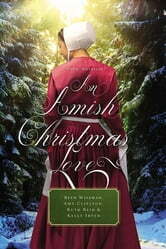 I am rating An Amish Christmas Love 4 out of 5 stars. The four stories are well-written and enjoyable to read. I liked the life lessons presented in each story. An Amish Christmas Love is the perfect escape novel.